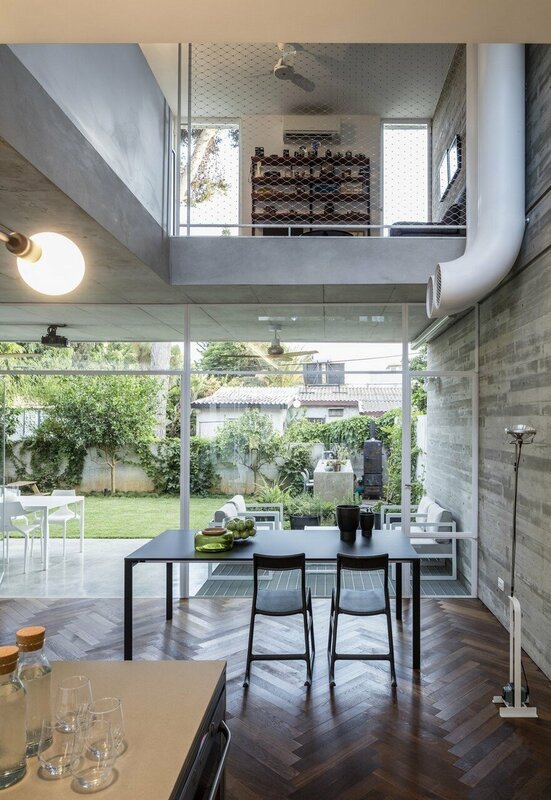 Suspended Patio House is located in a quiet neighborhood near Tel Aviv, Israel. 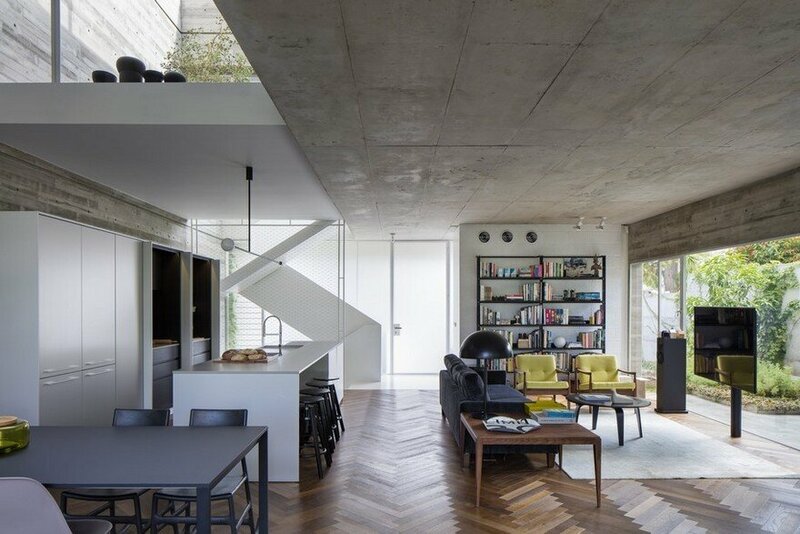 The rectangular prism, three story house comprising the ground floor, the first floor and the basement, has an exposed concrete frame from which the internal spaces and their openings were removed. Within the voids created, white plaster, metal and glass inlays were installed. 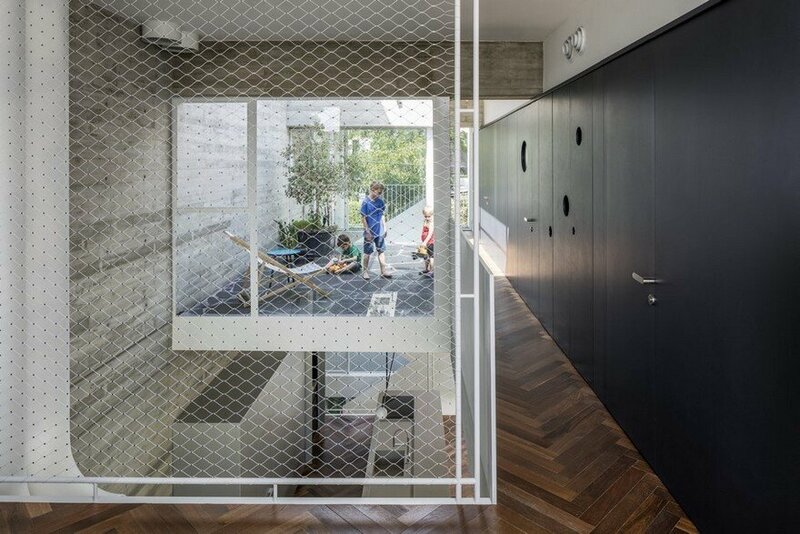 The ground floor facade facing the street is glazed with acid glass which emulates a light box and creates bilateral displays of light and shadow. 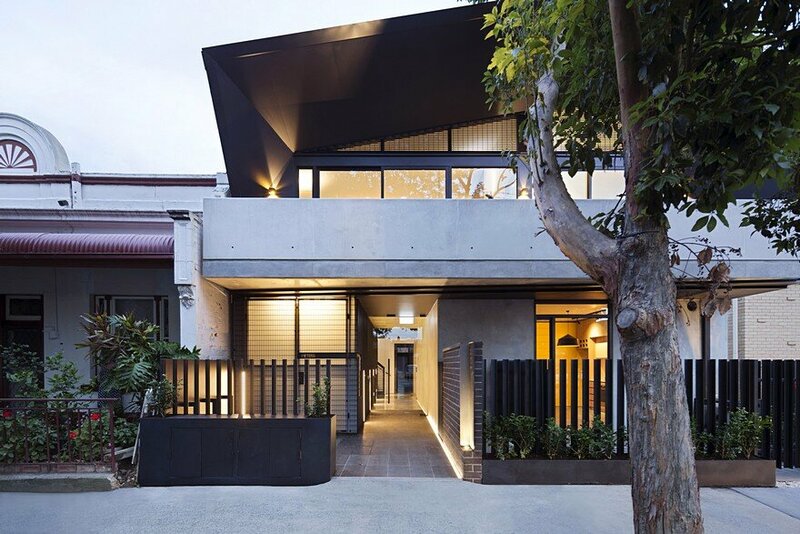 The interior space behind this facade incorporates the entrance space, guest bathrooms and the staircase that folds through the floors like origami. 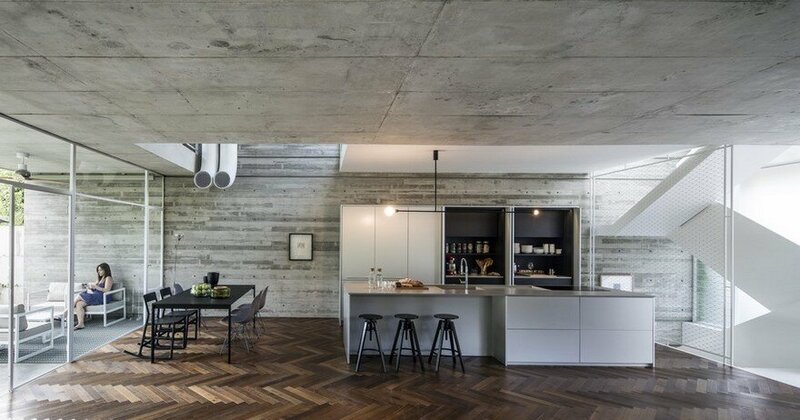 The ground floor concrete ceiling is suspended from massive beams located on the upper roof which creates a column free living space. In the double-height space above the kitchen, hangs a white patio. 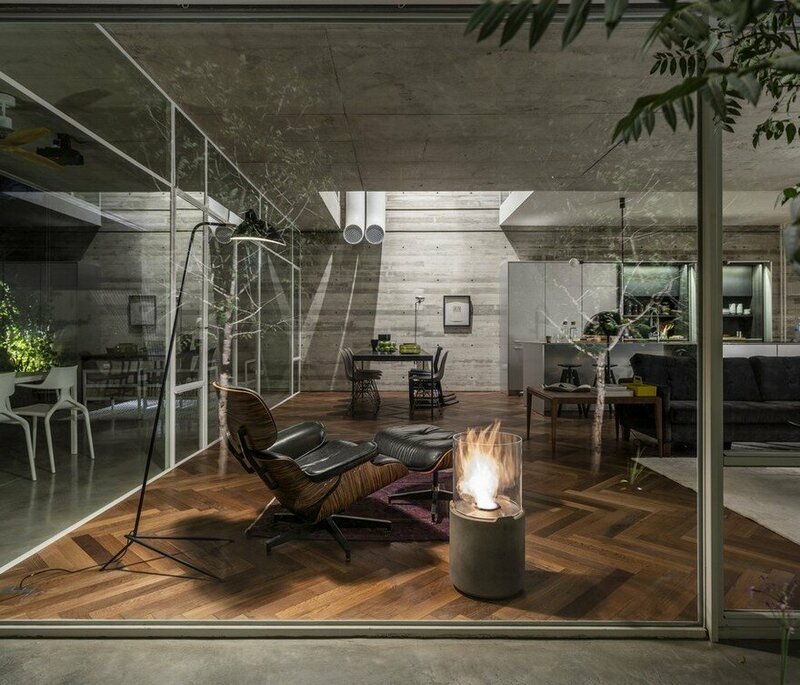 The large openings in the living area are framed in white metal and facing the garden as a transparent box. 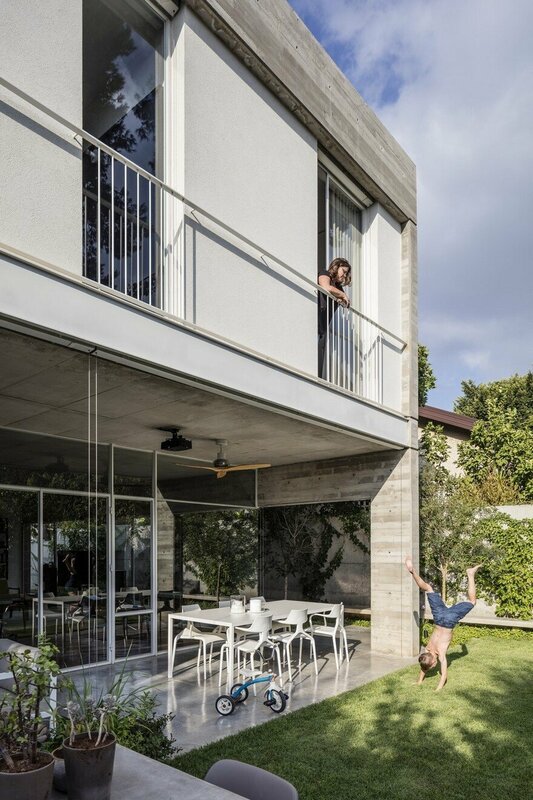 The Suspended Patio house is interwoven with outdoor spaces on all levels with the intention of creating a feeling of space, to allow the entry of natural light and fresh air as well as visual interactions between the spaces. The various functions are arranged along a central axis of movement passing across each floor and allowing views to the outside. 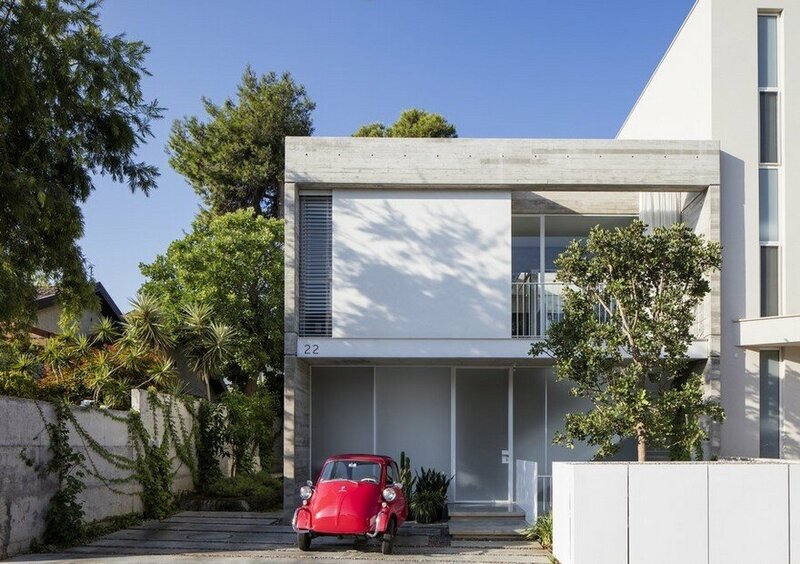 The movement axis on the ground floor leads from the street to the main entrance, passes between the living room and the kitchen and dining area and continues to a roofed outdoor area and the garden. 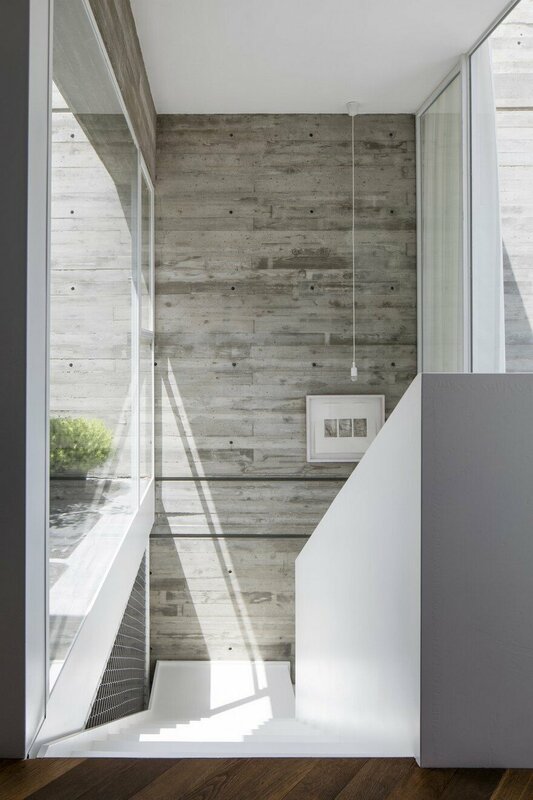 On the first floor the movement axis passes between the bedrooms and bathroom area, which are delineated by a grey wooden opening wall, and the family room and patio. In the basement, the movement axis runs between the children’s game area and study rooms. Natural ventilation is achieved by opposing openings on each floor placed on the exterior facades and on the interior facades facing the patio on the first floor. 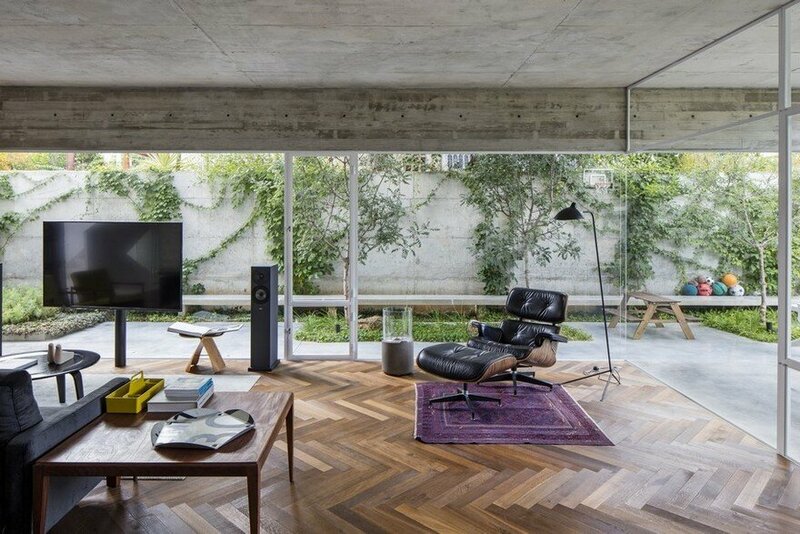 The exposed concrete, the steel and the glass are visually, acoustically and sensually balanced by using fishbone parquet flooring. 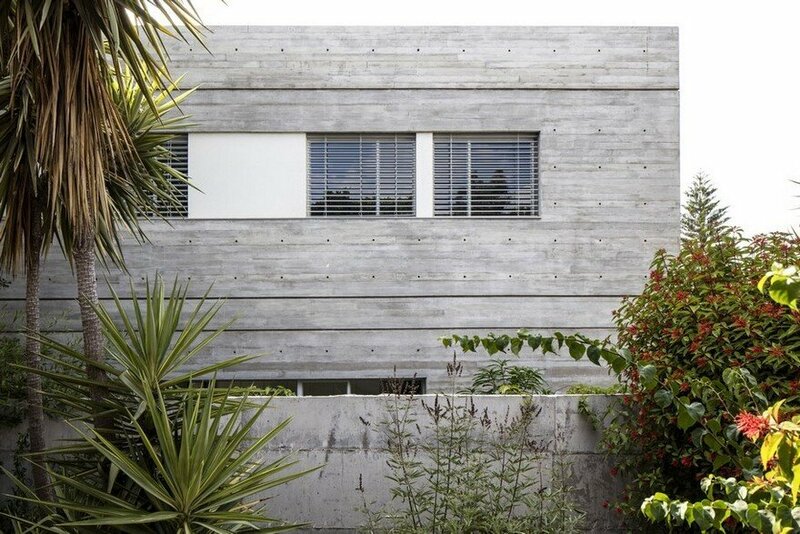 The concrete wall on the plot’s western border seems as if it has been moved aside from the structure to expand the living space into the garden. A concrete bench has been placed along the entire length of the wall to increase the perception of the plot length and to provide intimate seating areas in the garden. 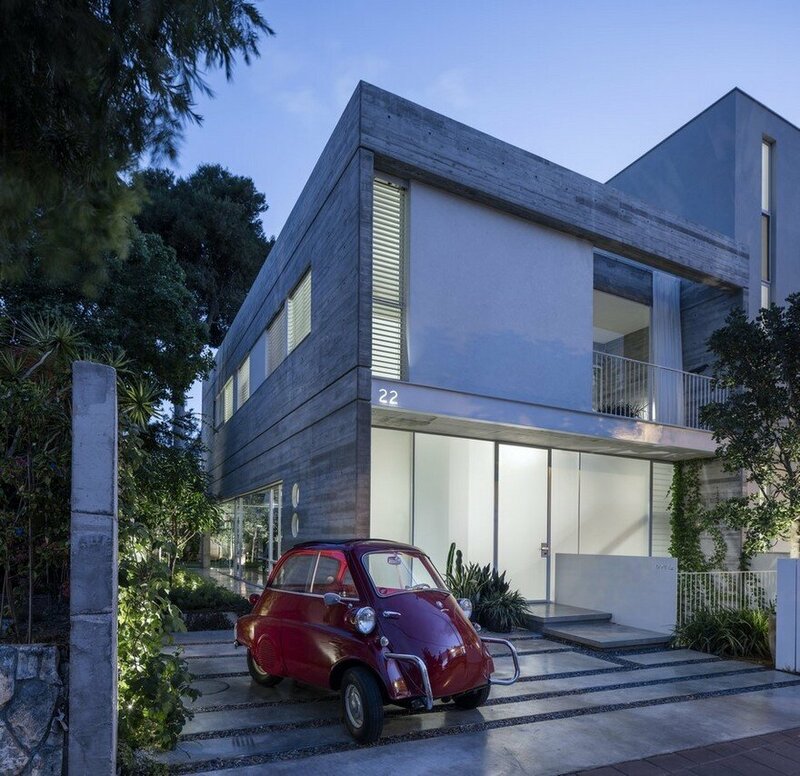 The architects chose trees characteristic of Israel such as Carob and citrus trees. Cacti, preserved from the original building that occupied the plot, have been planted in the basement patio. Between the ground floor living area and the garden there is a roofed outdoor area. Closing or opening its shades expands the interior and exterior spaces respectively. 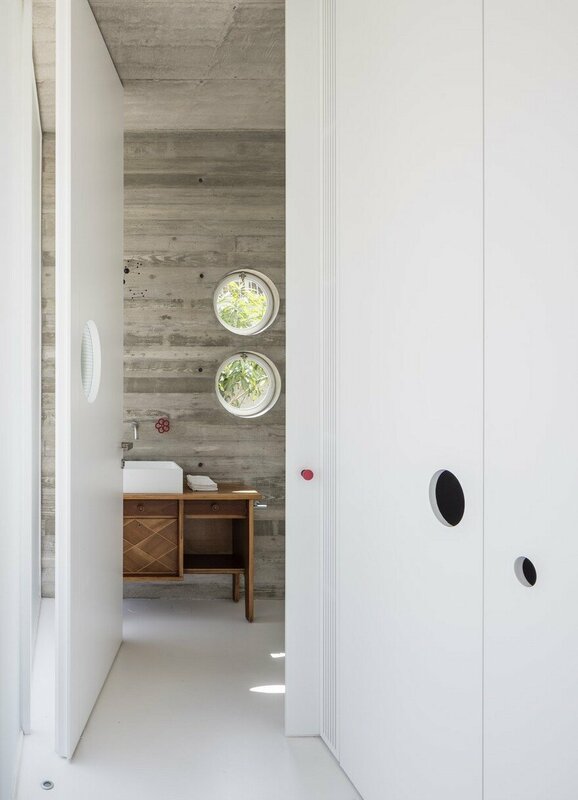 Round openings in the guest bathrooms, in the doors and the on the woodwork; exposed air conditioning pipes hang from the ceiling of the double-height space; and stainless steel mesh stretched and use as banisters enriching the architectural character of the house. The architects’ fondness for vintage furniture can be seen in the interior design. 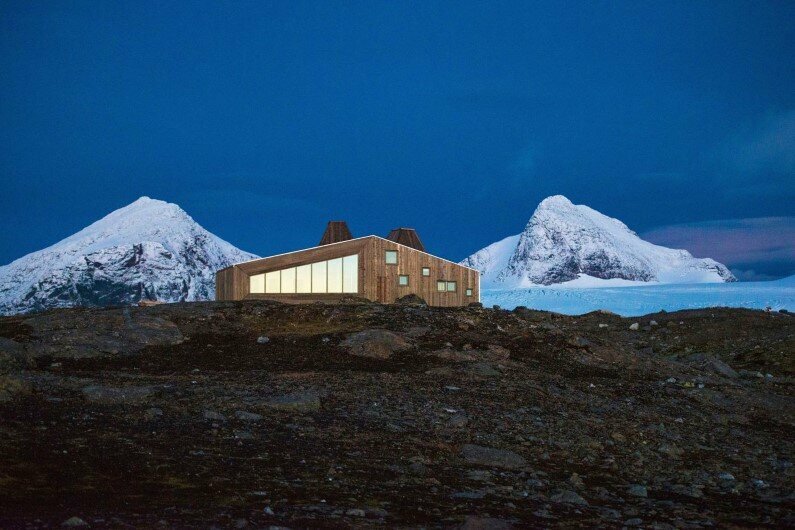 The furniture is modest and reflects the scale of the spaces it occupies. 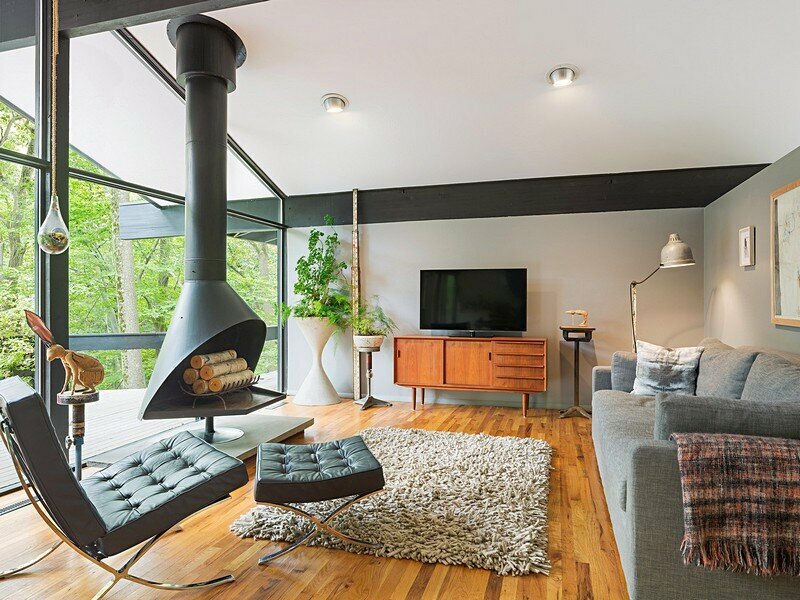 It includes furniture by the “Danish” furniture company; a table and chairs and a chaise lounge by Ray and Charles Eames; a butterfly chair by Surry Yanagi; lighting fixture by Achille Castiglioni and Serge Mouille. 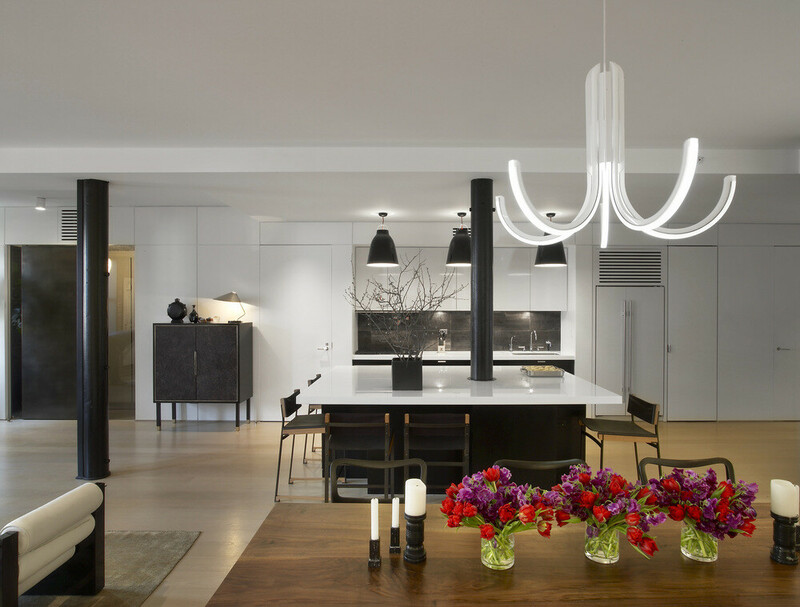 The minimalistic lighting fixture above the kitchen island was designed by the architects and matches the style. Bookshelves are located on each floor. In the basement, the bookshelves line the concrete wall; in the living area, a black aluminum bookcase stands against an exposed wall of white painted concrete blocks and holds a collection of art and architectural books as well as souvenirs collected by the couple. In the family room, there is a Danish bookcase displaying a collection of retro cameras, telephones and clocks. 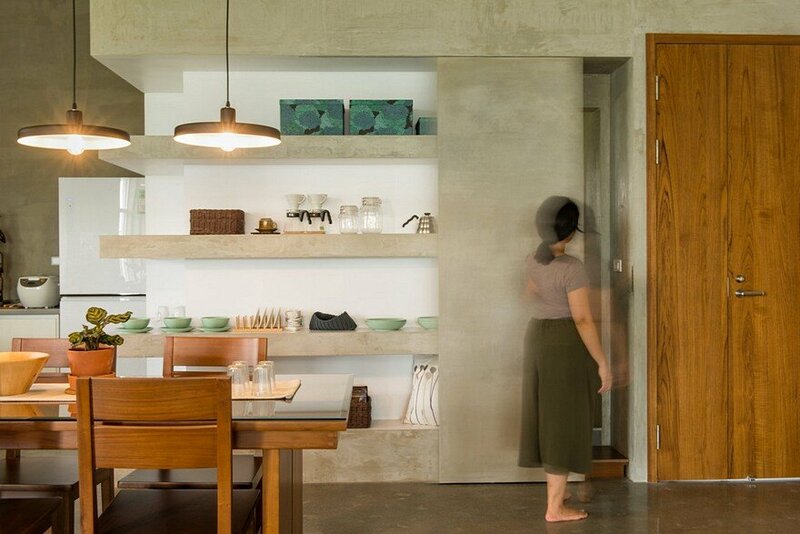 The walls of the house are decorated with architecturally oriented art created by local artists.